Delight your diners by reinventing the classic torta. The combination of textures and flavors will give them a familiar but mouthful experience. Marinate the pork belly with the rest of the ingredients. Let it marinade for at least 30 minutes before grilling. Heat a charcoal grill. Grill the pork until cooked through. Let the pork rest after cooking. Cut the pork into small dice. Combine all of the ingredients together in a bowl. Taste and adjust seasoning. Store in the chiller until ready to use. Divide the eggplant into 2 portions horizontally. Slightly flatten each part using a fork. Heat a round 5-6” sizzling pan over stove top. Grease the pan with a small amount of oil. Arrange the eggplants side by side each other. Allow ½ cm space in between each of the eggplant. Drizzle the eggplant with Knorr Liquid Seasoning. 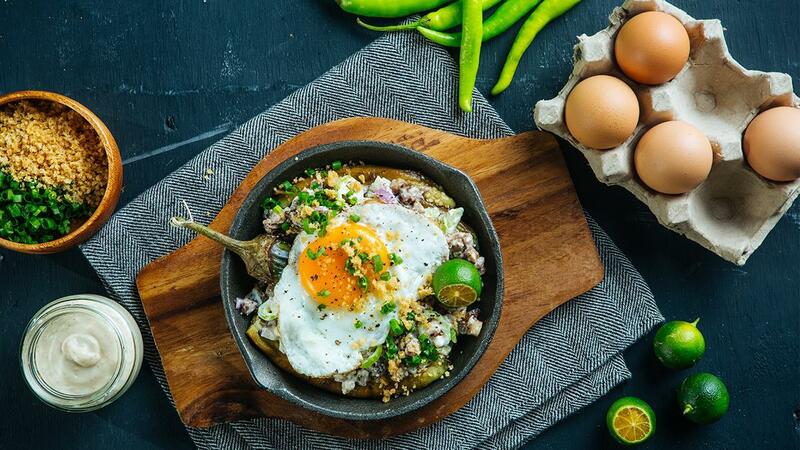 Warm the prepared sisig in a microwave. Mix the sisig with the soy dressing, onions and chilies. Top the eggplant with the sisig mixture while the plate is still being heated on the stove. Top with the fried egg. Sprinkle with crushed chicharon, garlic chips and spring onions. Serve immediately.